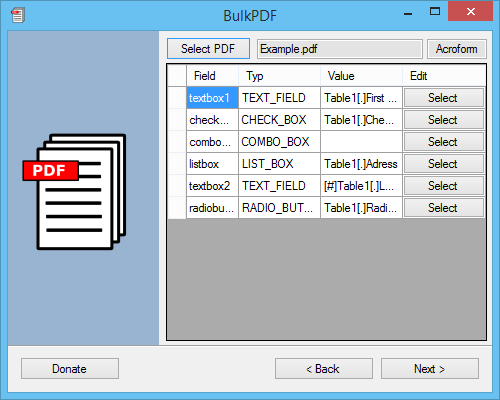 BulkPDF is a free and easy to use freeware software (Open Source), which allows to automatically populate an existing PDF form with different values. Only a spreadsheet (Microsoft Excel 2007/2010/2013, LibreOffice or OpenOffice Calc) with the desired values is required. 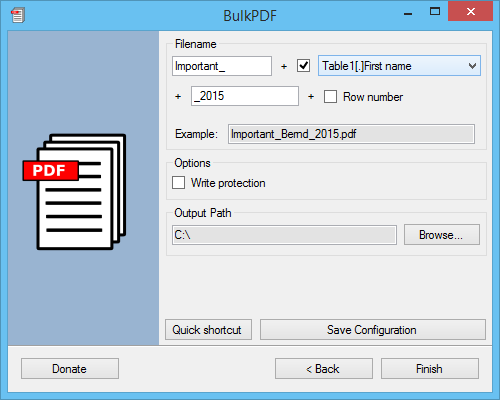 Learn more..
BulkPDF automatically recognizes the values in the selected table. Then the column names must be manually assigned to the form fields. After the fill progress have started, BulkPDF will go through line by line and write the cell value into the form. BulkPDF can really save you a lot of time that you would have wasted in filling multiple forms manually. It offers a really nice way of dealing with the multiple PDF forms. Softpedia guarantees that BulkPDF is 100% Free, which means it does not contain any form of malware, including but not limited to: spyware, viruses, trojans and backdoors.